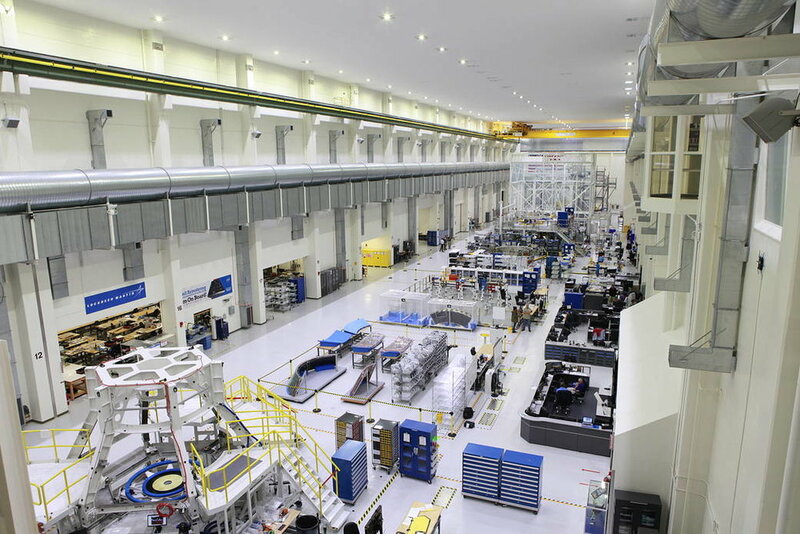 NASA and its industry partners have completed manufacture and checkout of 10 motor segments that will power two of the largest solid propellant boosters ever built. The solid rocket fuel will help produce 8.8 million pounds of thrust to send NASA's Space Launch System rocket on its first integrated flight with the Orion spacecraft. Technicians at Northrop Grumman in Promontory, Utah, in coordination with SLS program leads at NASA's Marshall Space Flight Center in Huntsville, Alabama, finalized the fabrication of all 10 motor segments and fitted them with key flight instrumentation. They'll be shipped to NASA's Kennedy Space Center in Florida, joined with booster forward and aft assemblies, and readied to power the SLS Exploration Mission-1 test flight when it launches from Kennedy. The uncrewed test launch will pave the way for a new era of groundbreaking science and exploration missions beyond low-Earth orbit, carrying crew and cargo to the Moon and on to Mars. Marshall manages the Space Launch System for NASA. 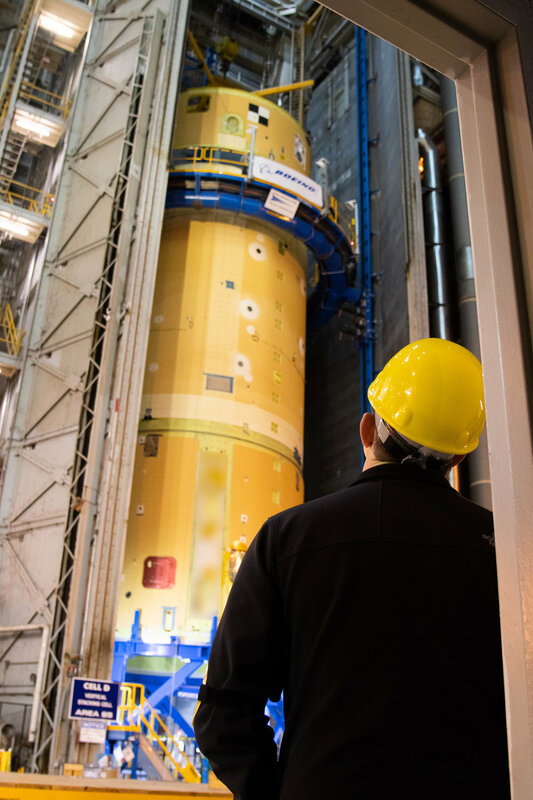 Engineers at NASA’s Michoud Assembly Facility in New Orleans have completed the “forward join,” connecting structures to form the top part of NASA’s Space Launch System (SLS) rocket’s core stage. This first core stage will send Exploration Mission-1, the first integrated flight of SLS and the Orion spacecraft, out beyond the Moon. The forward join mated three structures shown above: the forward skirt, the liquid oxygen tank and the intertank. This milestone marks the beginning of integration and assembly of the massive, 212-foot-tall SLS core stage, which will include the rocket’s four RS-25 rocket engines, propellant tanks, and flight computers. Now, NASA and Boeing, the SLS prime contractor, will continue to integrate various systems inside the forward part of the core stage and prepare for structural joining of the liquid hydrogen tank and engine section to form the bottom of the stage. These two parts of the core stage will then be assembled to form the largest stage NASA has ever built. Watch this video showing how the structures were connected. This week, NASA announced the successful completion of an important test of the Space Launch System (SLS) core stage that will experience the most significant stresses and loads during the launch of the world's most powerful rocket. The engine section test article was subjected to the extreme forces that it will experience during launch with the four RS-25 engines and the two five-segment solid rocket boosters. This important milestone continues to pave the way for the core stage engine and launch of EM-1 next year. "After numerous tests using millions of pounds of force, engineers have successfully completed structural qualification testing on the engine section for NASA's new deep-space rocket, the Space Launch System. "A true powerhouse, with four RS-25 engines and side attachment points for two solid rocket boosters, the engine section is located at the bottom of the rocket's massive core stage. The 212-foot-tall core stage will be the backbone of all SLS configurations, making the tests critically important for upcoming missions sending crews to the Moon, Mars and beyond. "During launch, the engines and boosters will produce more than 8 million pounds of thrust, requiring the engine section to be incredibly strong. "The engine section structural test article was built at NASA's Michoud Assembly Facility in New Orleans, and shipped to Marshall for testing. At Marshall, the hardware was installed into a unique 50-foot test stand where electronically controlled hydraulic cylinders pushed, pulled and bent the test article with millions of pounds of force." "The triangular shape represents the three main programs that comprise NASA’s Deep Space Exploration Systems: Orion, SLS, and Exploration Ground Systems, and is a classic shape for NASA mission emblems dating back to the shuttle era. "Several elements within the design carry symbolic meaning for this historic flight. The silver highlight surrounding this patch gives nod to the silver Orion spacecraft, including the European service module that will be voyaging 40,000 miles past the Moon in deep space. The orange rocket and flames represent the firepower of SLS. The setting is historic Launch Pad 39B, represented by the three lightning towers. The red and blue mission trajectories encompassing the white full Moon proudly emphasizes the hard work, tradition, and dedication of this American led-mission while also embracing NASA’s international partnership with ESA (European Space Agency) as both agencies forge a new future in space. "The Exploration Mission-1 emblem was designed in collaboration by the creative team working for the Deep Space Exploration Systems programs, which includes Orion, SLS, and Exploration Ground Systems, located at NASA Headquarters in Washington, Glenn Research Center in Cleveland, Johnson Space Center in Houston, Marshall Space Flight Center in Huntsville, Alabama, and Kennedy. Because the maiden mission of SLS and Orion is uncrewed, the program teams had the rare opportunity to conceive the mission identifier. Exploration Mission-2, which will fly with crew, will have an insignia designed by NASA’s Astronaut Office with the help of the crew that will fly aboard the most capable deep space system to take flight." Progress continues in 2018 on Aerojet Rocketdyne's RS 25 engines for SLS with the testing of 3-D printed parts to speed up production and reduce costs for future launches. FOX News reported on these successful tests in the link above. "NASA engineers picked up this year where they left off in 2017, conducting a certification test of another RS-25 engine flight controller on Jan. 16, 2018, on the A-1 Test Stand at Stennis Space Center near Bay St. Louis, Mississippi. The 365-second, full-duration test came a month after the space agency capped a year of RS-25 testing with a flight controller test in mid-December. A 3D printed part tested in December was tested again. This rocket engine component, a pogo accumulator assembly, is part of an ongoing series of tests with parts made using advanced manufacturing techniques that will make building future engines more affordable. "For this 'green run' test, the flight controller was installed on RS-25 developmental engine E0528 and fired just as during an actual launch. Once certified, the flight controller will be removed and installed on a flight engine for use by NASA’s new deep-space rocket, the Space Launch System (SLS). NASA is building SLS as the most powerful rocket in the world, designed to carry humans on the Orion spacecraft and enable missions to the Moon and Mars. "Launch of the SLS rocket will be fueled by four RS-25 engines firing simultaneously to generate 2 million pounds of thrust and working in conjunction with a pair of solid rocket boosters to produce more than 8 million pounds of thrust." 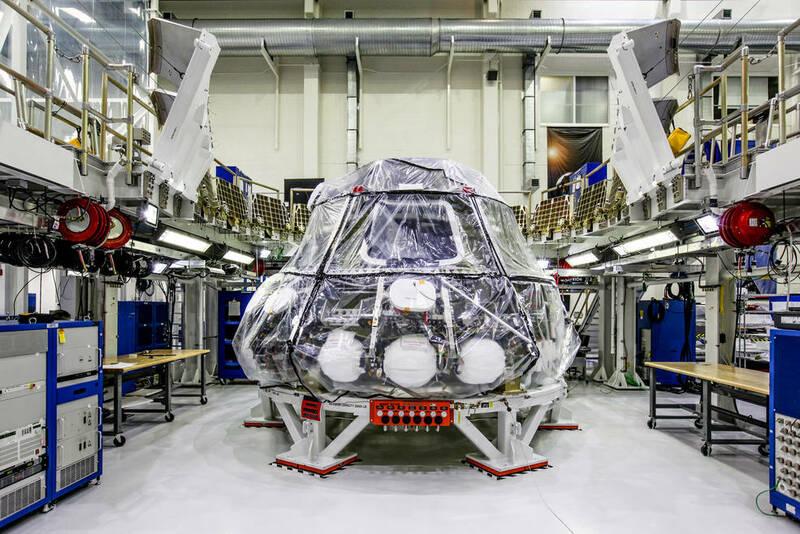 "NASA's Orion crew module is being prepared for its first uncrewed integrated flight test atop the Space Launch System rocket. Inside the Neil Armstrong Operations and Checkout Building high bay at NASA's Kennedy Space Center in Florida, a variety of test stands, processing bays and hardware are in view. Thermal protection panels and other components for Orion are in various stages of processing. Orion will launch on the SLS rocket from Kennedy's Launch Pad 39B on Exploration Mission-1. The spacecraft will travel thousands of miles beyond the Moon over the course of about a three-week period. Orion will return to Earth and splashdown in the Pacific Ocean." Progress towards Exploration Mission-1 continued this month with the completion of work on the four RS-25 engines that will be used to power SLS in its launch of Orion to the Lunar orbit. This milestone marks the last step before the integration of these four engines on the core stage of SLS for the "green run" testing. In its announcement, NASA noted that: "The flight preparations for the four engines that will power NASA’s Space Launch System (SLS) on its first integrated flight with Orion are complete and the engines are assembled and ready to be joined to the deep space rocket’s core stage. All five structures that form the massive core stage for the rocket have been built including the engine section where the RS-25 engines will be attached. "The SLS has the largest core stage ever built and includes four RS-25 engines, which previously powered NASA’s space shuttle. The RS-25 engines that are being tested and prepared for SLS were proven during the years they were responsible for propelling 135 shuttle missions, and have been upgraded for the first SLS flight. The four that will fly on Exploration Mission-1 supported a total of 21 shuttle missions. "In total, NASA has 16 flight-proven RS-25 engines and two development engines that are being used as “workhorse” engines for testing. These engines have been used to test new controllers – the brains of the engine – which have now been installed on the flight engines. The flight engines will be attached to the core stage to prepare for green run testing – the final test for the four flight engines and the core stage that will occur before the first mission." 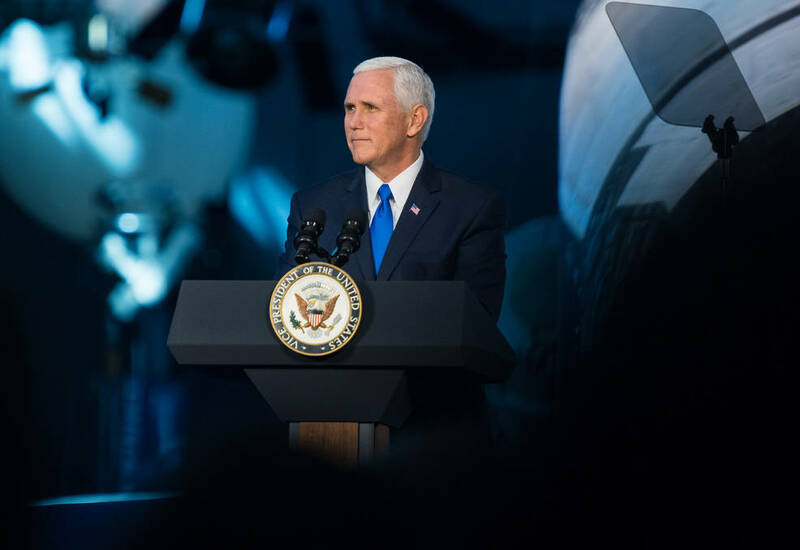 "President Trump has revived the National Space Council to assist him in developing and implementing long-range strategic goals for our nation’s space policy. On Thursday the council will hold its first meeting in nearly 25 years, and as its chairman, I will deliver a simple message: America will lead in space again. More than ever, American prosperity and security depend on U.S. leadership in space. Yet national space policy often has lacked a coherent, cohesive vision. The results not only are disappointing; they endanger the well-being of the American people. "The president has charged the National Space Council with restoring that leadership. The council’s objectives are clear. We will refocus America’s space program toward human exploration and discovery. That means launching American astronauts beyond low-Earth orbit for the first time since 1972. It means establishing a renewed American presence on the moon, a vital strategic goal. And from the foundation of the moon, America will be the first nation to bring mankind to Mars. "During this test, engineers replicated a situation in which Orion must abort off the Space Launch System rocket and bypass part of its normal parachute deployment sequence that typically helps the spacecraft slow down during its descent to Earth after deep space missions. The capsule was dropped out of a C-17 aircraft at more than 4.7 miles in altitude and allowed to free fall for 20 seconds, longer than ever before, to produce high aerodynamic pressure before only its pilot and main parachutes were deployed, testing whether they could perform as expected under extreme loads. Orion’s full parachute system includes 11 total parachutes -- three forward bay cover parachutes and two drogue parachutes, along with three pilot parachutes that help pull out the spacecraft’s three mains." RS-25 Flight Controller Testing Continues! "NASA engineers closed a summer of successful hot fire testing Aug. 30 for flight controllers on RS-25 engines that will help power the new Space Launch System (SLS) rocket, being built to carry astronauts to deep-space destinations, including Mars. The space agency capped off summer testing with a 500-second hot fire of a fifth RS-25 engine flight controller unit on the A-1 Test Stand at Stennis Space Center near Bay St. Louis, Mississippi. The controller serves as the “brain” of the engine, communicating with SLS flight computers to ensure engines are performing at needed levels. The test marked another step toward the nation’s return to human deep-space exploration missions." Powering up Orion for EM-1! "During the initial power-on tests, engineers and technicians connected the vehicle management computers to Orion’s power and data units to ensure the systems communicate precisely with one another to accurately route power and functional commands throughout the spacecraft for the duration of a deep-space exploration mission. In spaceflight, Orion will generate power through its four solar array wings which collectively hold about 15,000 solar cells that can harness enough electricity to power eight three-bedroom homes. The power and data units then distribute that power as needed throughout the spacecraft." "NASA’s Orion spacecraft is designed to take astronauts farther than anyone has ever gone before: to the moon, an asteroid, and even Mars. To propel Orion into space, NASA is also developing what will be the most powerful rocket ever built, the Space Launch System (SLS). SLS and Orion will provide entirely new capabilities and will initiate the next chapter of our nation’s exploration of the solar system. All of this will be powered by cutting-edge technology that has applications not only in space but on Earth as well: advanced materials, manufacturing techniques, design software, and life support equipment are just a few of the many spinoffs that have already come from Orion and SLS—with many more sure to come."